I like sweet things. More than I probably should. Ice cream. Brownies. Cupcakes. Riesling. Moscato...I could go on forever, really. But you get my drift. If it's sweet, most likely, I'll like it. I was watching good old Fox 8 in the Morning a few weeks ago and I saw a Kickin' it With Kenny spot featuring Fantasy Candies, a chocolate/wine shop within walking distance of my house. Although I'd driven by Fantasy Candies nearly every day, I'd only stopped in once, years ago, when they were in another location. I was immediately impressed by the selection of chocolates that appeared on my screen and I was even more impressed when they mentioned having weekly wine and chocolate tastings in the store for only $10. And so I went. Well, we went. Me and the new boyfriend. (more on that in another post) He and I joke that we're fat kids at heart, so before heading out to dinner last Saturday, we dropped by Fantasy Candies in the 6:00 hour for some booze and candy. Who says you shouldn't have dessert first? We were warmly greeted by Joel, the owner and he got us set up with a plate full of some of his amazing candies and equally amazing wines. 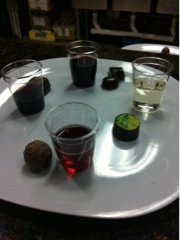 He took the time to talk to us about the different wines and how they complimented the various chocolates. Clearly, he knows his stuff. And you can tell how passionate he is about his business. I chatted with him for a little bit about other wine tastings in the area and asked him about business and he was more than happy to talk to me for quite awhile. We were given 4 generous wine samples and 4 different kinds of chocolate, including Fantasy Candies' signature chocolate, SweetDreams 72, a high cocoa chocolate. I can honestly say that I liked all of the pairings. There was a zinfandel with a dark chocolate, a Riesling with a key lime truffle, a sparkling red wine with a milk chocolate truffle, and a milk chocolate caramel with sea salt with a port. 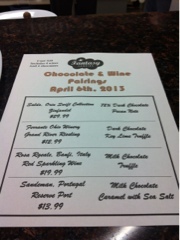 I can honestly say that I liked all of the chocolates equally because they were all so rich and good. I'm not much of a red wine drinker, but the wines paired with the chocolates were all really flavorful and completely complemented the candies. So if you're a sweets lover like me, you like supporting local businesses, and you're looking for something fun and unique to do on a Saturday night, drop by Fantasy Candies!